Ai Editorial: JetPrivilege has been focusing on the single view of its members ever since its existence as an independent entity. Ai's Ritesh Gupta assesses how the company is strengthening its data prowess. Airlines, as an industry, has had to live with a tag of being a `laggard’ for years owing to the process-centric nature of this business. But there have been carriers that chose to embark on the digital trajectory earlier than others and the same reflects in where they stand today. One such carrier is India’s Jet Airways. The company took a massive step around four years ago. The airline chose to set up a separate entity, Jet Privilege Private Limited (JPPL) to manage its frequent flyer programme (FFP), JetPrivilege. JPPL, a joint venture between Jet Airways and Etihad Airways, is a specialised loyalty and rewards management company, set up to develop, manage, operate and market the FFP. The programme has grown aggressively, to touch a base of 8.5 million members over the years. In August 2016, the base crossed the 5-million mark, and it ended up at 7 million last year. The pace with which the programme has shaped up indicates that the JPPL team has been successful in its journey to build the programme as a platform-based, digital business. To fully capitalise on the potential of FFPs, companies need to connect all the dots and work out a strong profile of the customers. JPPL has been working on the same. “We are always on the lookout to bring new features and improvements to our programme. The path we take eventually leads us to – ‘what does the data say?’. We have focused our efforts on establishing an environment and culture that is data-centric, it has been the key for us. Data has proved to be a fuel to foster innovation, define the value of the programme, for testing (whether something is working or not) and eventually to hack profitable growth in all our businesses. This journey is an ongoing one,” shared Manish Dureja, MD, Jet Privilege. He shared that JPPL is adding around 4000 members on a daily basis. This profile is being further strengthened with the data on the online behaviour of the members on the programme’s various digital platforms. Recently, JetPrivilege members were offered an option to earn as well as redeem their JPMiles for fuel at select IndianOil outlets (this partnership with the fuel major will be rolled out in a phased manner, with a potential of covering all of IndianOil’s 20,000 outlets across the country), marking the first such deal between a frequent flyer programme and a Fortune 500 company in India’s fuel and energy sector. FFPs are also looking at integrating their respective loyalty programmes into a member’s everyday life by rewarding the members for their spends on luxury, fashion or any other high aspiration products, as well as for their spends on fuel or grocery shopping or reserving a table for curated meals at select restaurants. In the travel hospitality sector, JPPL recently introduced its hotels.jetprivilege.com platform featuring 1.5 million properties from the likes of Booking.com, Agoda.com, Expedia.com, Hotels.com, Homestay.com etc. “We have positioned ourselves as a meta-search for hotel properties via this platform (the booking is completed on partners’ sites) to earn JPMiles,” said Dureja. As for association with platforms with massive traffic such as Amazon India, Flipkart, Paytm in India etc., Dureja mentioned that not all fall in line with what JetPrivilege stands for. “We don’t partner with Paytm as it’s largely a cashback platform. Our reward ecosystem is an anti-thesis of the cashback system,” he said. 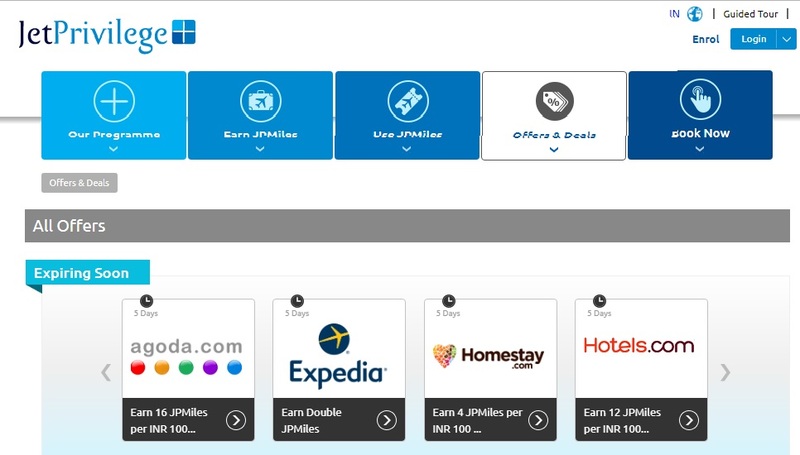 “We have a currency that offers a lot more than what cashback has to offer and that’s where our value proposition is.” He further added, “We do work with Flipkart and Amazon and our members who shop with them earn JPMiles” (The members have to go through an affiliate website managed by JetPrivilege to earn JPMiles). JetPrivilege, like other customer-friendly FFPs, is looking at ways and means to delight it’s members across various customer touchpoints. For instance, they are experimenting with various initiatives like offering a simplified option at the check-out on their shopping site, pay with JPMiles or ‘JPMiles + Cash’ etc. to sustain the stickiness of the loyalty programme. JetPrivilege is also moving away from expiring JPMiles for their members, as long as the members have performed one eligible activity in their membership account over the last 18 months. Dureja added that all these initiatives are important to get members closer to a transaction and even help them in experiencing a world of privileges and benefits, which they would appreciate. JetPrivilege understands that when members are offered the choice and flexibility in the way they earn and redeem their reward currency, their engagement with the programme increases, which in turn leads to them sharing more data about their choices with the programme. “It all boils down to data – whom to target, when to target, what to target them with etc. To harness data and deriving insights, staying relevant and contextual with our embers, we are building the capabilities of our data analytics and engineering teams. We are devising ways to pre-empt and predict what would resonate with our members by using artificial intelligence and machine learning models,” shared Dureja. At any given point of time around 800 segments are being personalized on JetPrivilege’s website. That’s only because of the data journey that the brand embarked upon earlier on and the team is confident of going further on this journey to serve and meet the needs of an even larger set of members in a personalised way.